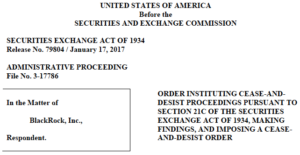 On January 17, 2017, the U.S. Securities and Exchange Commission (“SEC”) entered an Order sanctioning BlackRock, Inc. (“BlackRock”) for using “voluntary” separation agreements that contained an SEC whistleblower award waiver. BlackRock’s form separation agreement included “language requiring a departing employee to waive recovery of incentives for reporting misconduct available under, among other things,” the SEC whistleblower program in exchange for receiving their separation payments and other consideration. BlackRock added the SEC whistleblower award waiver into its separation agreements after the SEC adopted the SEC whistleblower protections contained in SEC whistleblower rule 21F-17. To the fullest extent permitted by applicable law, you hereby release and forever discharge, BlackRock, as defined above, from all claims for, and you waive any right to recovery of, incentives for reporting misconduct, including, without limitation, under the Dodd-Frank Wall Street Reform and Consumer Protection Act and the Sarbanes-Oxley Act of 2002, relating to conduct occurring prior to the date of this Agreement. The SEC whistleblower program was created by the Dodd-Frank Act. According to the SEC’s Order, 1,067 departing employees signed BlackRock’s separation agreements containing the SEC whistleblower award waiver. The Order acknowledged that “before being contacted by the Commission staff in this matter, BlackRock voluntarily revised its separation agreement” to remove the clause containing the SEC whistleblower award waiver. The Order also acknowledged that the SEC was not aware of any instances where a former BlackRock employee who had signed a separation agreement containing the waiver “did not communicate directly with the Commission staff about potential securities law violations”. Nor was the SEC aware of any instances in which BlackRock tried to enforce the award waiver provision or tried to prevent a former employee from communicating directly with the SEC. … and (iii) cooperate voluntarily with or respond to any inquiry form the Commission or other federal or state agencies or self-regulatory organizations. Furthermore, the Policy informs employees that they “have the right to not be retaliated against for reporting possible securities law violations”. It is not clear from the SEC’s Order whether BlackRock undertook to create this Policy and require the mandatory annual training on its own, or whether it was part of an undertaking agreed to with the SEC to settle the case. BlackRock further agreed to notify the SEC at least 60 days prior to discontinuing the mandatory annual training. The SEC imposed a civil monetary penalty on BlackRock in the amount of $340,000. The Order also required BlackRock to make reasonable efforts to contact its former employees, give them a link to the Order or a paper copy should an employee request it, and provide them with “a statement that BlackRock does not prohibit former employees from seeking and obtaining” SEC whistleblower awards. BlackRock took direct aim at our whistleblower program by using separation agreements that removed the financial incentives for reporting problems to the SEC … Asset managers simply cannot place restrictions on the ability of whistleblowers to accept financial awards for providing valuable information to the SEC.